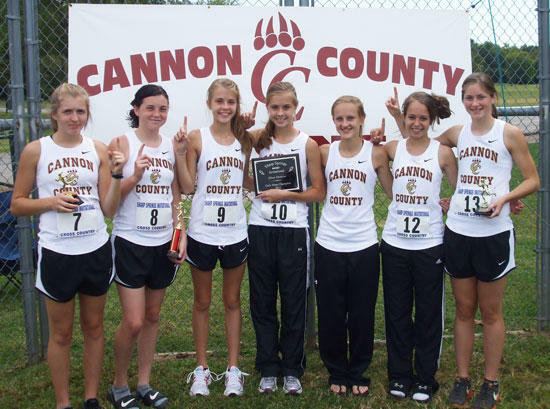 In four days the CCHS girls Cross Country team has finished first place at their last two meets. Saturday the Lady Lions were awarded the championship in the silver division at the Sharp Springs Invitational in Smyrna. Three days later the girls traveled to Webb and took first place at the Webb All-Comers meet in Bell Buckle, Tennessee. Some of the teams succumbing to the Lady Lions include Gallatin, Blackman, MTCS, Macon County, Franklin County, Fayetteville, Shelbyville and Webb. Hannah Faulkner finished 2nd, Macy Clements 4th and Madison Walkup 16th at Sharp Springs. At Webb Macy Clements finished 3rd, Hannah Faulkner 4th and Madison Walkup 7th. Other runners contributing to the win at both races include Katie Hickman, Lauren Turney, Sarah Hickman, and Lauren Simmons. Honorable mentions at Webb include Savannah Bailey with a blue ribbon in girls JV and Jordan Turney placing 10th and medaling in the boys varsity. The cross country program is a great addition to the high school sports program congrads to the teams and coaches.